Enjoying dessert is one of man’s pleasures. It’s just a shame that most of us feel some sort of accompanying “guilt” when trying to enjoy these sweet treats. Plain and simple it should be a pleasure but not a guilty pleasure. It doesn’t have to be that way. Yes, things will have to change if you want to “enjoy your cake and eat it too”…but you’ll be rewarded with guilt free desserts that not only taste yummy and look delicious but taste even better than the ones you’ve been eating that offer little if any nutrition but are heavy on the calories. What are these mystery desserts that allow you to enjoy them without the guilt monster killing the moment? Raw desserts. That’s right. Making and enjoying raw desserts kills the guilt monster and allows you to enjoy some of your favorite desserts made with all natural ingredients. Because they are made with all natural ingredients, they completely eliminate the bad fats that are often used in desserts by replacing them with coconut and coconut oils and use things like dried fruits and other natural sweeteners in place of sugar, with ground nuts replacing traditional flours. Not only are we replacing dead ingredients with live foods, we eliminate the “cooking” part. That’s right…no need to heat up the kitchen making these family favorites. 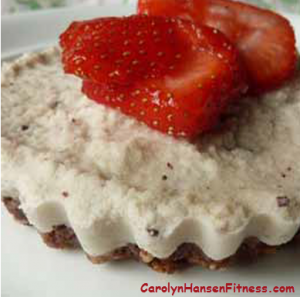 Isn’t it time to add raw desserts to your lifestyle? You’ll enjoy health-promoting vitamins, enzymes, fiber and healthy fats while enjoying some of your favorite foods and all this can be done for a very reasonable amount of money in little time. Our bodies need all the help we can give in the way of proper nutrition to keep the immune system where it functions at peak level. Eliminating cooked, processed desserts and treats and replacing them with raw treats is one more step that works to help our bodies rather than “tax” our bodies. And, as a added bonus, these healthy desserts help to prevent disease and overweight as well as slowing the aging process. You’ll eliminate any guilt you personally feel towards any desserts and treats you put into your body and you’ll actually feel good about serving dessert to your family. It’s definitely a win-win situation. Place all ingredients in food processor and blend until a sticky dough has formed. Turn out and press into base of 4 tartlet pans or one larger dish or pan. Place cashews, honey, coconut oil and vanilla essence into food processor and blend adding the water a tablespoon or two at a time to allow mixture to blend and become thick and creamy. Add cacao nibs and pulse until they are broken up and well mixed through the filling. Spoon mixture out onto bases in tartlet pans and place in fridge to firm up before serving. Garnish with your favorite berries to add color, texture and flavor. It’s time to focus on you…and my new program “Reclaim Your Longevity” helps you to do just that so that you are healthy and vital…dancing well into your senior years.